There are over 200 species of livebearing fishes in the family Poeciliidae that occur from Florida to Argentina. Poeciliids are particularly diverse in Central America and some of the larger Caribbean islands, where they are among the dominant faunal elements in freshwater environments. Some genera and species of livebearers have become important models in evolutionary ecology research, providing textbook examples for studies in sexual selection and animal behavior, hybridization and speciation, as well as life history evolution. Nonetheless, the vast majority of species and even genera within the family remain unstudied. Hence, we have a poor understanding of the nature of ecological diversity within the family as well as the relative contributions of ecological and sexual selection in driving diversification. Recent studies have made great progress in elucidating the phylogenetic relationships among a large number of poeciliids. This offers the opportunity to study broad scale patterns of functional diversification with a large taxon sampling. Current projects in the lab focus on the quantification of a variety of phenotypic traits and mining data on environmental variation to describe the functional diversity in poeciliids and to test fundamental hypotheses about the interactions of ecological and sexual sources of selection in driving evolutionary diversification. Some poeciliids have broad geographic distributions and exceptional tolerances to physiochemical stressors. Others are narrowly endemic – sometimes only occurring at one or a few localities – and have very specific ecological requirements. How physiological tolerances have evolved, and how they promote or hinder diversification in the family, remains largely unexplored. 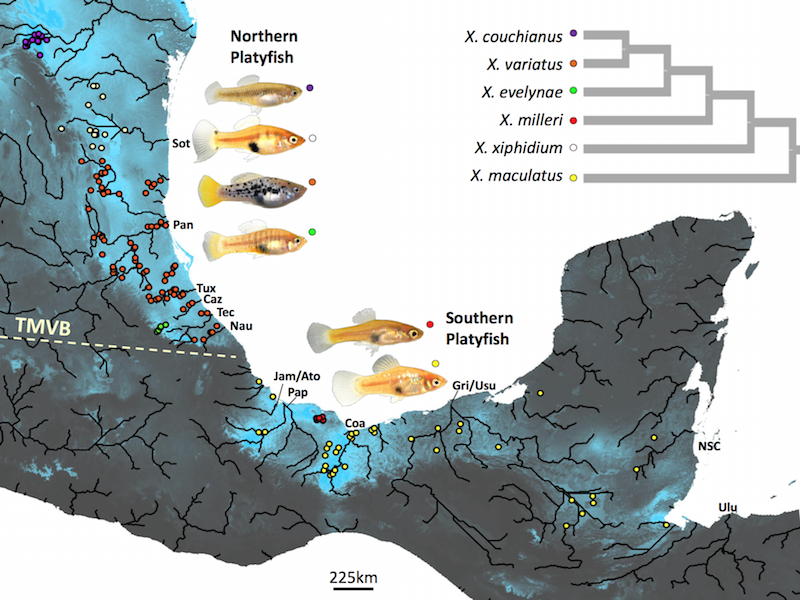 We combine distribution modeling, physiological assays, and genetic approaches to study the role of physiological traits in adaptation and diversification of poeciliid fishes.